Scott McGillivray isn’t just the host of HGTV’s Income Property, a show that helps cash-strapped homeowners make money through smart home renovations, he’s also a consummate entertainer who’s just as comfortable with a cocktail shaker as he is with a sledgehammer. In his most recent project, Reno to Reveal, Scott has designed a swanky home bar that will quench anyone’s thirst for great design. Scott breaks down how he did it in his own words below. The wine cooler, or bar fridge, is the anchor of the space. So when choosing you have to take into account size, style, capacity, and function. I opted for a stainless steel wine cooler that holds up to 38 bottles and has two separate temperature zones, so you can chill your whites and reds separately. It fits comfortably into the base of the cabinetry while still leaving room for a pull-out pantry shelf next to it. 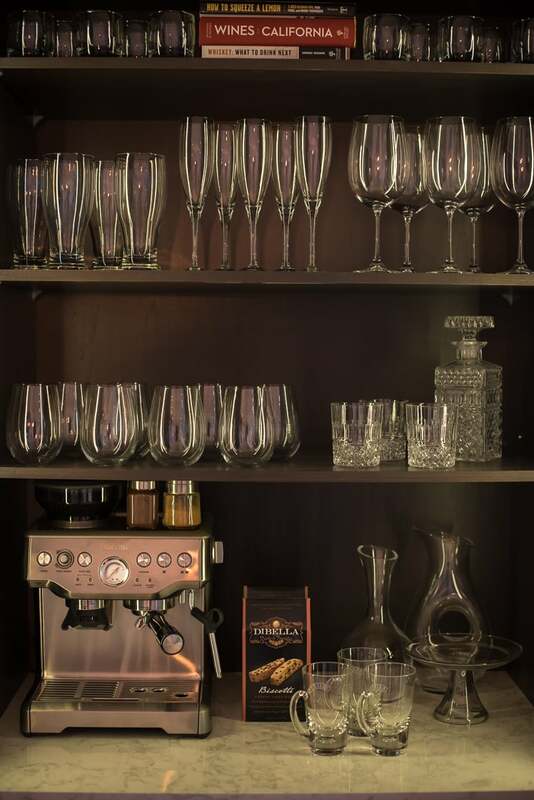 Storage is an important element of any home bar. You need to accommodate your fridge, all your bottles, your drinkware, and any extras like cocktail shakers, garnishes, and whatever else you need to live out your bartending fantasies. 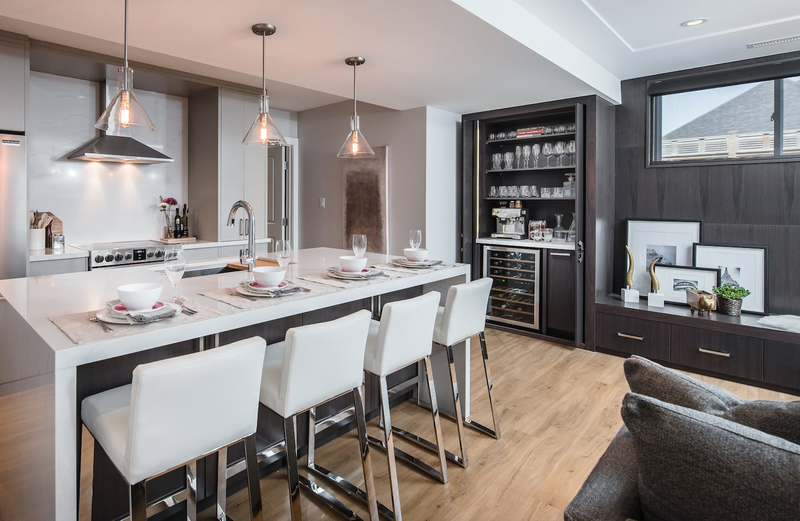 When designing this unit I included shelves to hold all the glassware and then included a pull-out pantry drawer for all the bottles that don’t need to be refrigerated. The counter surface of the bar is covered with a piece of quartz. The reason I did this is because it looks great, but quartz is also the most durable and safest counter option currently available. It’s nonporous so it doesn’t stain or hold onto bacteria, and you can cut your lemons and limes without worrying about damaging the surface. Lighting is essential and I addressed it here in two ways. The wine cooler has interior lighting that allows you to see right into the back so you never choose the wrong bottle, but I also installed strip lighting along the perimeter that turns on and off when the doors are opened and closed. I also installed pocket doors so that the cabinet doors can be recessed into the unit allowing for maximum light to wash in from the living area. You never know when you’ll want to use a blender, coffeemaker, or other small appliance so I included an outlet inside the cabinet for the sake of convenience. In order to meet the electrical codes it was installed with a relay so that it shuts off automatically when the cabinet doors are closed. I chose a black outlet cover so that it would blend in with the back of the cabinet. Although the bar is an important element of the space, I didn’t want it to be the main focal point, so I incorporated it into a larger media wall and made sure that it could be hidden away when not in use. The exterior of the cabinet is clad in a slate gray walnut and blends effortlessly with the rest of the room. For more great design tips, check out Scott’s Reno to Reveal and follow along on social media using #reno2reveal.